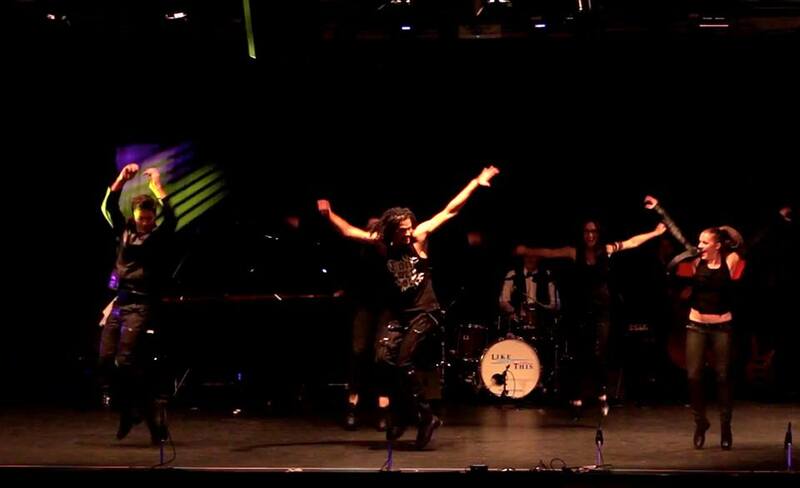 View our performers profiles (Tap Dancers / performers based in Melbourne). Do you want exciting and uplifting entertainment to add to the experience you are creating? Provide the best experience for your guests by providing an enjoyable night to remember. You want a group that can provide their staging and tech requirements and know how to liase efficiently with you / your event team. These performers are amazing at what they do, as well as professional, reliable and adaptable to your situation. Tap Dance is a top entertainment choice because of its universal appeal to all generations. 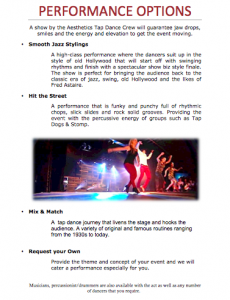 It is unique in today’s entertainment scene and carries traditions as well as new elements As many of your guests would not have experienced live tap dance, it is a powerful visual and audio experience when you are in the same space as the performers. 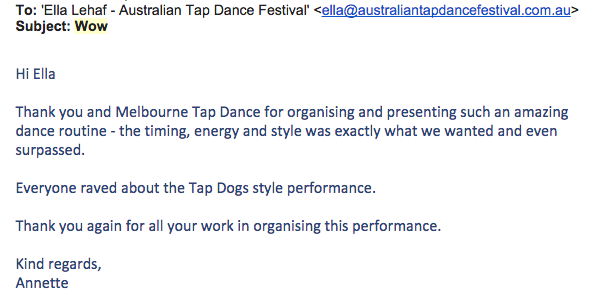 For a unique, surprising and skilful class act, book the Melbourne Tap Dance group now to perform at your event. Leading the Melbourne Tap Dance crew is Winston Morrison who has performed at Wangaratta Jazz Festival, Los Angeles Tap Festival, Montreal Tap Dance Festival, New York City Tap Festival , Australian Tap Dance Festival, So You Think You Can Dance Westfield Dance Off , VnV Boudoir Fashion Show, Melbourne Fringe Festival, Spiegeltent, Melbourne Food and Wine Festival, Minton’s Playhouse (New York), The Door (Hollywood), Showmans (New York), Hoxton Bar and Kitchen (London), Passing Clouds (London), Christmas Entertainment at Melbourne Central Shopping Centre, 1700 show (Channel 31), Australia’s Got Talent (Channel 10), Today Show (Channel 9), 9am (Channel 9), Studio 3 (ABC3) and appeared on Commonwealth Bank’s “You Can Tap” campaign. 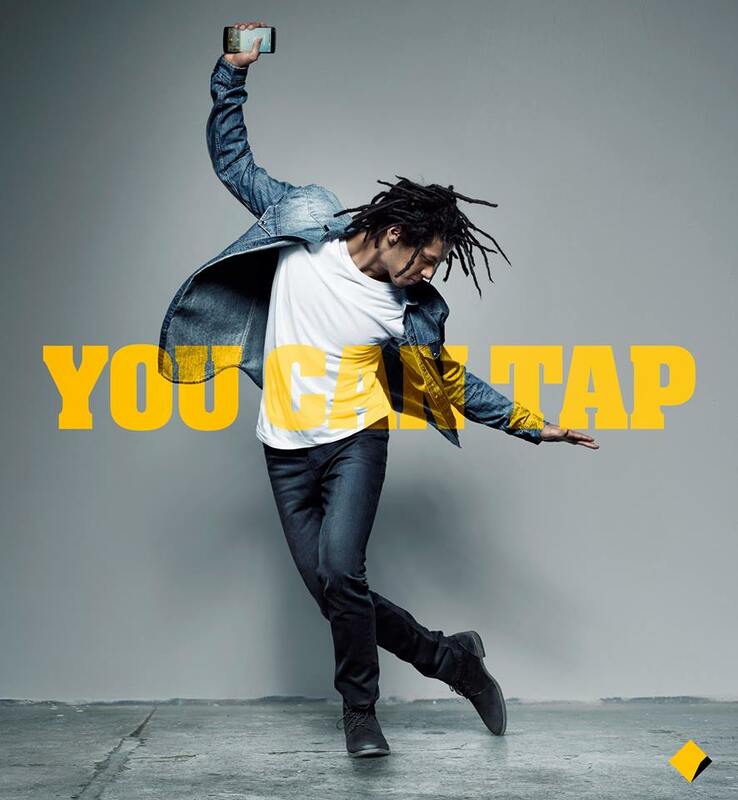 Tap dance iis known for the popularity and appeal from TV and movies (Mr. ‘Bill Bojangles’ Robinson, The Nicholas Brothers, Fred Astaire) since the 1920’s through to today in music videos (Beyonce, Michael Jackson) and now movies like Happy Feet and TV shows such as So You Think You Can Dance. 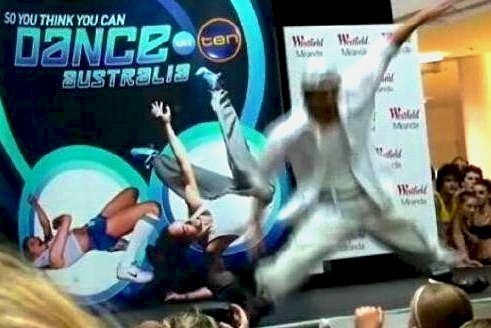 Performing at So You Think You Can Dance promo event. they are professional to deal with. A truly professional and spectacular dancing troupe"
We are versatile, and adaptable to a range of themes, whether you want an industrial or street scene, a 1920’s night, or maybe the vibes of jazz or hip hop. A corporate band for the night is also available in addition to the number of dancers that you require. Enquire now to see what we can offer you!